Your 4-hour private SUV tour is driven and narrated by a Bay Area local owner-operator with years of professional tour experience. Private tours save time and provide a level of service not always available to bus & van passengers. Clear English is spoken. Feel free to interact with your personal guide and ask questions on route to the park. Located just 12 miles (19km) from San Francisco's city limits, Muir Woods makes a perfect quick getaway from the concrete jungle. The fog is good for more than just natural air conditioning, it helps grow really tall sequoia coastal redwoods! Muir Wood's tallest tree is 258 feet (79m) in length. The Muir grove averages in age from 500-800 years with the oldest estimated to be at least 1200 years old. Before or after the woods (schedule to be determined) you get free time in Sausalito to walk along the water, shop, dine or sip some wine. Transportation is normally provided in an extended 2015 Ford Expedition EL XLT equipped with 4-wheel drive. This vehicle was selected for its size and 3rd row space which has 17% more leg room than other SUVs of its model year. There is trunk space for a wheelchair or stroller. Coach buses over 35 ft are not advised on the steep, narrow, and winding road down to Muir Woods. You may request that your driver takes slow if you are sensitive to the road conditions near Mount Tamalpais. If you are thinking about driving yourself, the popularity of this park has led to some major parking congestion. They now operate on a strict parking reservation system (parking reservation included). Your private SUV tour drops you off closer to the forest entrance than the public parking lots. Since private tours don't have multiple pick up/drop off locations like some mixed group tours, you will save valuable time on your limited reservation. Don't get stuck waiting on tardy strangers. Pickup is at your San Francisco hotel in either the morning or afternoon. Time will be set at least 2 days before your tour. You typically arrive at your first destination after 30-60 minutes, depending on pickup location, loading time and traffic. Some days Sausalito will be first, other days it will be Muir Woods. 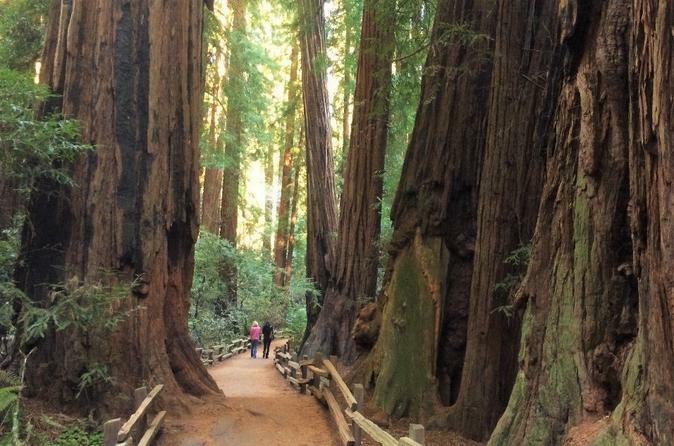 Due to the limited mandatory parking reservations, you must be flexible to visit Muir Woods. This is not a tour for people who must have a solid plan in advance. We will do our best to get you the most time in each destination. (Typically 60-90 min in Muir, 60 min in Sausalito). Not included: $10 admission per person 16 years and older. This fee is not included to prevent overcharging of smaller groups under 7 people, National Park annual pass holders and families with children. This way you only pay for the entrance fees you need. Only rangers can guide inside the park so your driver will give you instructions before you set off to explore on your own. It takes about 45 minutes round trip to Cathedral Grove where you find the oldest trees in this grove. If you want to take a longer walk, the Hillside Trail may be open depending on conditions (60-75 minutes). If you did not eat yet, The Muir Woods Cafe has coffee, tea and tries to use locally sourced ingredients whenever possible. In Sausalito, enjoy a dockside meal, taste some wine or stroll the harbor while taking in the views of San Francisco. If you want more time in Sausalito, you may end your tour there and enjoy the views from the ferry boat or take a cab back at a time of your choosing (neither included). Private tour advantage: If you are 100% sure you will depart the tour in Sausalito and make your own way back, scenic alternatives such as the Golden Gate Bridge viewpoint & Muir Beach may be available so ferry passengers don't get shorted on time they paid for.